I recently realized it's been months since I've shared a wash day on the blog and weeks since I've shared anything about my hair. While my hair hasn't been put on the back burner per se, it hasn't been a big focus of mine personally or on my blog. So what's been going on with my hair lately? For the last six months or so I've been struggling with being satisfied with the moisture levels of my relaxed hair. This has resulted in breakage that I didn't experience before and me ditching products, trying new products and changing my regimen. 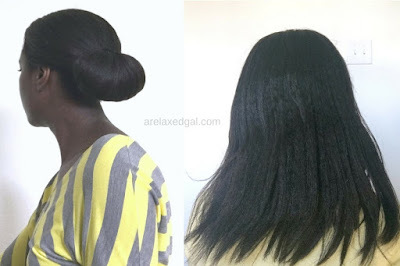 It wasn't until recently that I started revisiting some old wash day posts from the beginning of my hair journey and I realized that my new regimen may be the issue. Over time I've simplified my regimen. I'm doing fewer treatments, using fewer natural oils and not moisturizing and sealing as often as I was in the beginning. While that's made for less money being spent on hair products and fewer hours being spent on my hair, my hair doesn't seem to have benefited as much as I would have liked. After this realization, I studied my current hair regimen and compared it to my old one when my hair was flourishing and have decided to make some changes. Sometimes change isn't always for the better, especially if it's stripped away things that were beneficial and effective for things less so. Not only am I changing the products I use, but also how and when I use them. Go back to using the SheaMoisture African Black Soap Deep Cleansing Shampoo . I stopped using this shampoo last year as it wasn't helping my scalp issues and I experienced some serious itchy scalp, but I think I may have had a bad batch. I recently started using it again and didn't have the same issue. In fact, my scalp has itched less than it has in months. I plan to start using this shampoo at least once a month as my clarifying shampoo. Bring back the hot oil treatment. I can probably count on one hand the number of hot oil treatments I've done this year. When I first started my hair journey I was doing hot oil treatments more regularly and my hair loved it. I had so much, suppleness and manageability when I did. I'll start off trying to do hot oil treatments at least twice a month as a pre-poo. For my hot oil treatments, one of the oils I'll be using is a natural oil I used at the beginning of my hair journey - sunflower oil. I've found some drugstore conditioners that I like and while they are ok they really can't compare to the conditioning and moisture retention I got when I used salon brands Thermafuse and Design Essentials. Also, I've decided to try another deep conditioner. I think my hair isn't responding to the Eden BodyWorks deep conditioner like it used to (sad face). I've found that sometimes my hair needs a break from products I use on a regular basis. Otherwise, the product isn't as effective. SheaMoisture Mongongo and Hemp Seed Oils High Porosity Moisture-Seal Masque. My hair has so many of the symptoms of high porosity hair so this masque is really appealing to me. I like that it has proteins and apple cider vinegar in the ingredient list. SheaMoisture Sacha Inchi Rescue & Repair Hair Masque. Some of the ingredients in this masque intrigue me - Sacha Inchi Seed Oil, Quinoa, Vitamins A & E - and it's from a brand whose products I use and like. Design Essentials Almond & Avocado Moisturizing and Detangling Conditioner. I've found it hard to find a conditioner with enough slip so it can really help me with detangling. In addition to the almond and avocado in the conditioner, the fact that it claims to be a detangler is what got it on my list. Mizani Moisturefuse Moisturizing Conditioner. When this has been used on my hair during salon visits I liked the results, so I'm hoping I'd have similar results at home. I've been moisturizing and sealing my relaxed hair, but not daily like I was towards the start of my relaxed hair journey. I've also stopped using a natural oil for my sealer. I'll be going back to moisturizing each evening and using a natural oil as a sealant. Right now I plan to alternate between two natural oils - sunflower oil (which I'm also using for my hot oil treatments) and coconut oil. I'll still be deep conditioning each week. That is a given which it comes to taking care of my hair which is why it's not listed along with moisturizing and sealing. The only way the deep conditioning will vary each week is whether it comes before or after cleansing. 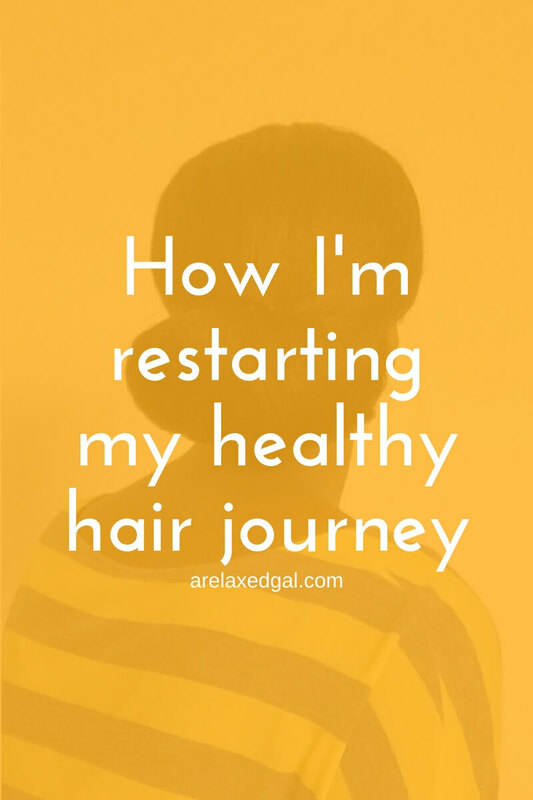 Have you made any changes to your hair regimen lately?